There was a time that I truly looked forward to a Rob Zombie film. I mean I love his original stuff House of a 1000 Corpses and The Devil's Rejects, but his work on Halloween was just an epic disappointment! Now yesterday Zombie breaks news that he is going to stick in the remake world instead of doing something original (heavy sigh). What's worse is realizing that Zombie intends to really bring his own spin on the original classic scifi horror. He told Variety, "I have the freedom once again to take it in any crazy direction I want to." So just how does Zombie intend to change the original? One thing that is for sure is Zombie will change the Blob itself. He explained, "My intention is not to have a big red blobby thing, that’s the first thing I want to change." Which instantly raises the question in my head, why call it "The Blob" then you douche? To give a little clarity Rob Zombie had this to say, "That gigantic Jello-looking thing might have been scary to audiences in the 1950s, but people would laugh now. I have a totally different take, one that’s pretty dark." 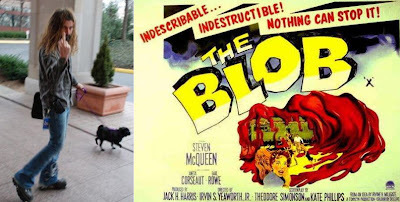 Please, please, please Rob, don't make your hack of a wife Sheri Moon Zombie the Blob! I mean that would be scary, but I just can't take watching her in another one of your crappy remakes! The original 1958 classic that starred Steve McQueen followed a large meteor that crash lands in middle America. From inside of the meteor comes an oozing gooey substance that begins to grow exponentially consuming anything that gets in its path. The remake is being produced by the original The Blob producer Jack Harris and his wife Judith along with Zombie, Richard Saperstein and Brian Witten. Saperstein told Variety the film will have a project $30 million budget.